Mixed Signals was written for Lisa Weiss. It involves a computer (or phone) tracking piano notes and responding. 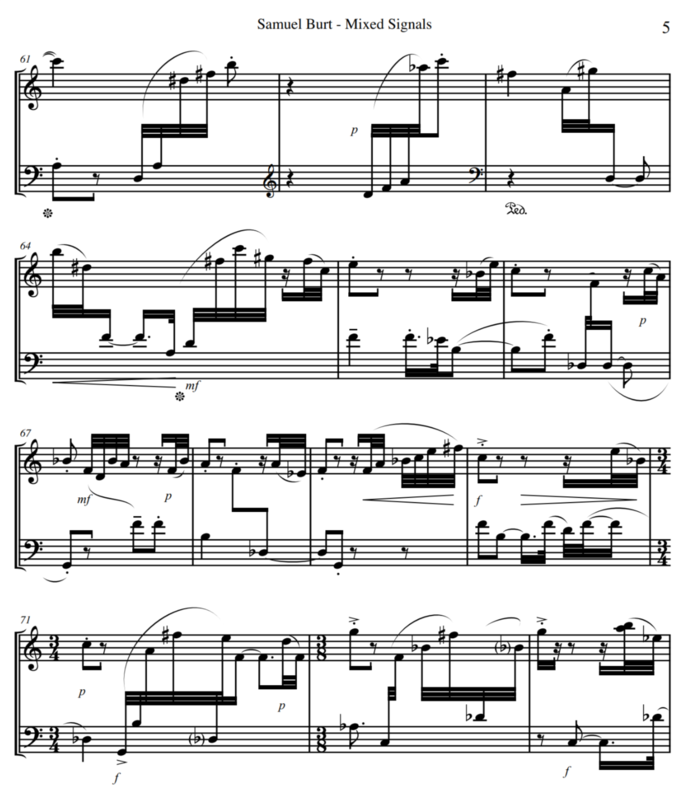 The pianist plays a solo part written in a flowing, yet rigorously composed style, while the computer answers with randomly reordered notes creating a harmonic cloud. This is the first of a series of works for piano and electronics to be composed in 2018. Humbaba's Trod is a work composed of daxophone recordings. The daxophone is a bowed wood instrument which is symbolic in relation to Humbaba. Humbaba guarded the cedar forest where the gods lived until Gilgamesh came and fought Humbaba and then cut the trees down to build the gate of a city. The daxophone provides a wide range of sounds (both in pitch and color). It was perfect for generating a rain forest type of environment where each "creature" inhabits a particular range. This work was performed first at Goucher College during the computer music concert. A piece combining the best extended techniques with beautiful layers of shimmering string textures. Composed to be maximally challenging yet easy to assemble. This is an excerpt of the ending of Fountain Resonances. Performed here by C.R. Kasprzyk and string players from the Peabody Conservatory. Daxophone and other WIIIIIIIILLLLLD sounds! Samuel Burt has been driving the experimental music scene in Baltimore through the High Zero Foundation, producing the High Zero Festival, the Red Room series, and the Volunteers' Collective Workshop. He has been an active composer of chamber music for classically trained musicians. Occasionally, these activities overlap, and sometimes they lack the sense of newness you get when you first discover that you can listen intently to two people scraping pieces of metal together. Which is why he has taken up instrument construction. The daxophone, pictured, has unlimited potential for making new (grunting, hooting, singing) noises simply by cutting a new tongue out of a piece of thin wood and clamping it down. The daxophone is a friction idiophone, meaning you bow it to make the entire wooden body vibrate. 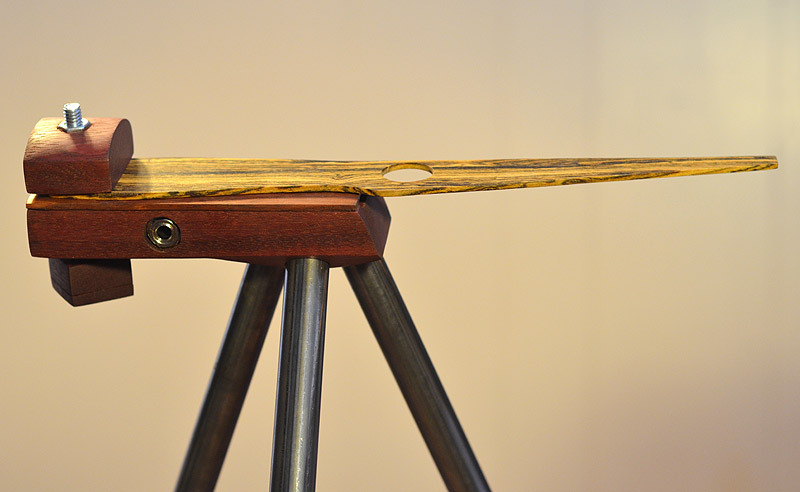 The sound comes from carefully chosen and shaped pieces of wood called tongues. Tongue making is both a sonic and visual art. Each is unique in wood grain, shape, and sound. 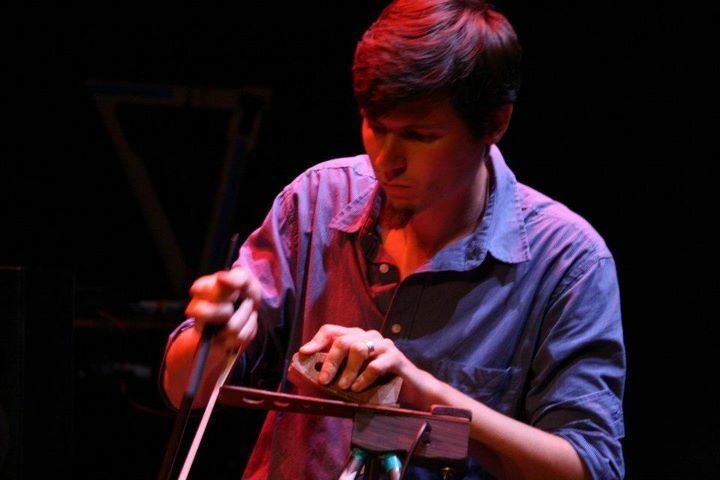 Burt has played daxophone regularly with avant-free music band Coy Fish led by Sarah Hughes. Amongst the many performances of 2018, Coy Fish opened for the Library of Congress's "Summer Movies on the Lawn" screening of the Wizard of Oz taking audiences somewhere over else over the rainbow. Burt composed music for two daxophonists and percussion, performing it with Eric Franklin and Shelly Purdy at Artscape 2018. The work, entitled Renku No. 1, is built around a form of Japanese poetry where individuals add stanzas to a poem. Samuel Burt and Maria Shesiuk are nearing completion of an album of daxophone and synthesizer music. They've been recording and editing monthly through 2018. 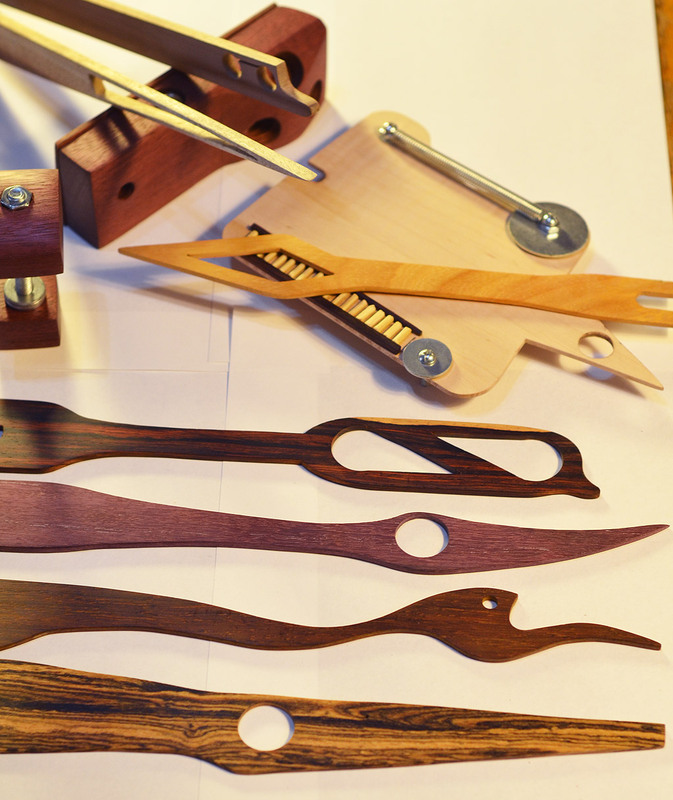 Daxophone tongues are made from many different species of wood. You can appreciate their art visually and auditorily as each one produces a very different range of tones with highly contrasting mouth-like resonances. Also pictured is a skatching surface attachment with spring reverberation inspired by the work of Tom Nunn. Renku No. 1 was composed by Samuel Burt. This performance took place during Artscape 2018 at the UB Student Center. It was performed by Eric Franklin and Samuel Burt on daxophones and Shelly Purdy on percussion. Renku No. 1 is built around a form of Japanese poetry where individuals add stanzas to a poem. It features haikus by Matsuo Bashō. The performers are guided through a process of performing new musical poetic material to accompany these haikus. This is a composition of daxophone sounds. This demonstrates the wide range of timbre and pitch of which the daxophone is capable. An incredible duo of Samuel Burt and David More experimenting with frighteningly beautiful and dangerous sounds. Samuel Burt learned much from his many pianist friends. Over the past two decades, he's written a significant amount of music for piano, most recently Mixed Signals and Node Ode. Lisa Weiss and Burt have begun a project to introduce new works for piano and live electronics. Weiss performed Mixed Signals at Goucher College in 2017. Mixed Signals is a work for computer or cell phone that listens to the notes the pianist plays and generates an echoing harmonic cloud, reordering the notes and stretching them out. This work will also be used to christen the new piano at the Immaculate Heart of Mary in March. The aim of this project is to allow the performer to plug a cell phone into an audio cable and set the phone on the piano and begin performing these new works with minimal effort. Electronic music is often inaccessible to performers with limited computer music background, often requiring that someone else's presence to work through the technology. With modern developments and if programed with great consideration, the composers can reduce the technical requirements. Page 5 of Mixed Signals, a work for piano and cell phone. Rain Making Construct is a work for solo piano. Burt accomplished his goal to provide intermediate pianists with a piano work that is both simple and complex. 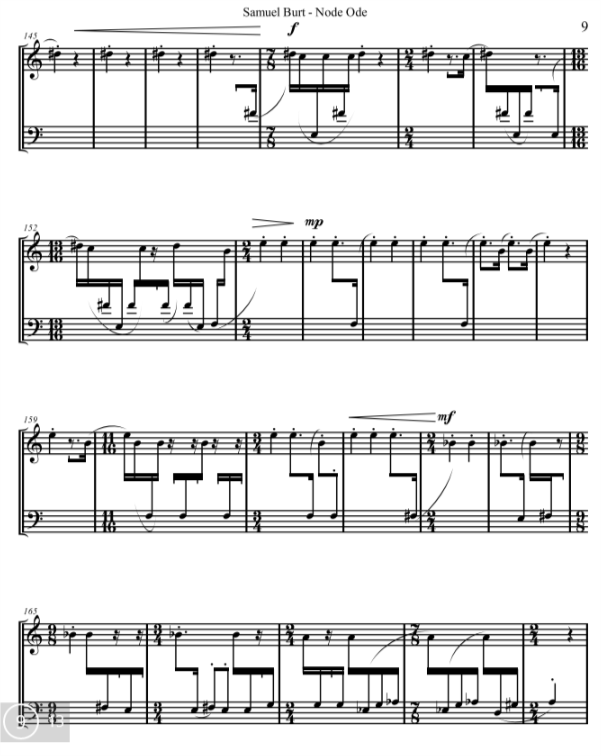 The work bridges the gap between Bartok's easy works and Ligeti's most challenging etudes. Like Ligeti, it presents an approach to the piano that is both polyrhythmic and process-oriented where delight and whimsy are both emergent properties. The Billings Music Teachers Association commissioned Rain Making Construct in 2012. Lee Hancock performed and recorded this mp3. The first page of Rain Making Construct for solo piano. An award winning composition for violin and piano, it breathlessly flies across an abstract landscape and ends in a rhyme. Performed here by Aurelie Baziger and John Chernoff. Part of a page from Dime Novel. 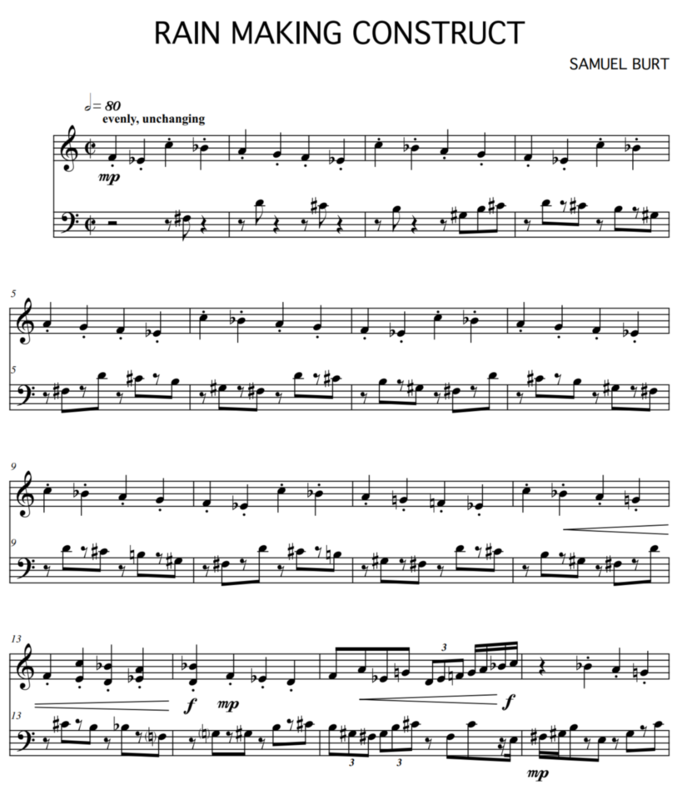 A page from Node Ode, the newest composition for piano by Samuel Burt. Node Ode explores complexity within the simplicity of repeated notes. How are these compositions different from other modern classical music? Burt lives in many musical worlds. He grew up on the traditions of classical music and jazz and became involved in experimental improvised music as a teenager. He blends together the rigor and ornate craftsmanship of classical music with the rhythmically-free, spontaneous, and untuned harmonies of improvised music. His work as an educator affords him opportunities to oversee student works that range through all different styles of contemporary popular music. These influences manifest obliquely in his music, through manipulation of dynamic energy levels and unusual applications of repetition. While his style is most often centered around densely packed parametric sets of newly invented procedures, the effect of his music ranges from beautiful and flowing to suspenseful. It always engages the mind and guides the listener through the unexplored frontiers of music, both emotionally and intellectually. Burt's next project could be a commission from you, even for orchestra! Please, contact him if you like what you hear. Excerpt from Finite Gestures, a composition by Samuel Burt. Performed at Artscape 2018 by Samuel Burt, bass clarinet, and Shelly Purdy, percussion. This is one of the densest arrangements of information I have ever produced, a mixture of observationally simple and subtle. You can hear my obsession with long process forms. Performed by Erin Freeman conducting a Peabody Orchestra. A corner of a page from Parametric Transmutations. 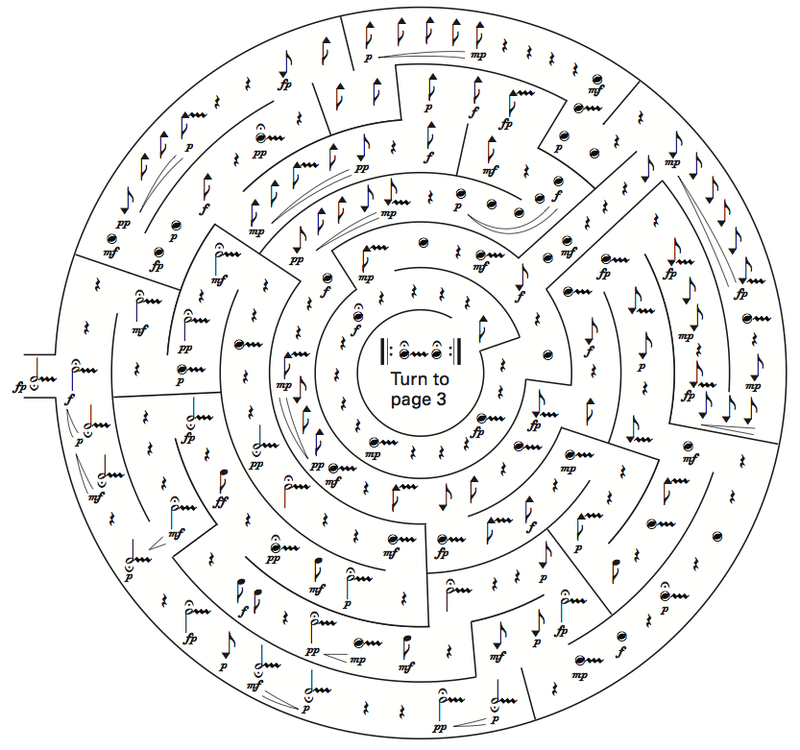 A semi-graphic score for indeterminate instruments. Each performer finds their own way through each page creating cannons and retrograde imitation along the way.